A passive income product is a great way to boost your Etsy income on autopilot. Passive income means that you do the work once, and keep getting paid. For example; Printables on Etsy. Let me give you 20 examples of passive income products so you can start making sales on autopilot. Some of the links mentioned in this blog post are affiliate links. This means that when you use that link to purchase a product/service, I receive a small commission. Don’t worry! I only recommend products I swear by! Thank you for supporting my art business. Printable wall art is the most common passive product to sell on Etsy. People are always looking for a way to upgrade their home. And a printable is perfect for that. Your customers can print it out themselves, and hang it in their home/office. You can easily design printables with Canva or Adobe Illustrator. That is why a lot of people are selling printable planners on Etsy. You can find the style that you like, print it out, and clip it to your clipboard or staple it together. If you have a unique style other people admire, and you like it to organize; Why not combine both and create a digital planner? SVG stands for Scalable Vector Graphic. People use SVG’s to design graphics, print stickers, cut vinyl designs or to use them as clipart. There is a really high market for SVG’s. A lot of people (especially Etsy shop owners) are looking for a way to style their product package. The packaging is the first thing their customers see, so it should make a killer impression. Most of the business owners don’t have photography skills but are always looking for unique stock photos. Let’s face it: Free stock photo sites like Unsplash and Pexel are not original anymore. And let’s not even start with those cheesy stock photos on Shutterstock. Your mission is to create unique, appealing stock photos. But make sure you keep a ‘’theme’’ so your focus is clear. Don’t create stock photos about business, woman, cooking, sports, animals, etc. Make sure to choose a clear focus, or to create bundles. If you want to take your stock photos to the next level, try to create mock-ups. For this, you need some Photoshop skills and products with no designs on it. I also have a blog post about 30 product mock-ups I recommend for your Etsy shop. If your niche is wedding, parties, events or something similar; You should design invitations. You could easily design them in Canva/Illustrator, or create an editable template in Canva or Word so your customers can edit them themselves. If you decide to edit them for them, it is not completely passive anymore, but hey, it is better than producing, packaging and shipping them yourself right? Cards are a little different from invitations. You could choose to design birthday cards, valentines cards, Christmas cards, etc. The possibilities are unlimited. Your customers can download it straight away and print the design on their cards. Clipart is almost the same as SVG’s. But clip art gets mostly used for graphics and SVG’s for cutting out files like stickers. If you are good at hand-lettering and Graphic Design: This is your chance to design your own font. A lot of business are looking for a unique font. Pssst! Did you knew that I teach an entire in depth course on Skillshare about how I use Printful to create physical passive products?? This course contains exclusive content that is not available in this blog post. You can watch the entire course for free by following these simple instructions. By clicking the link, you will get redirected to a page where you will get 2 free months of Skillshare, so you can binge-watch unlimited classes. You can cancel anytime. I am a digital artist myself, and I can’t tell you enough how much I love customized Photoshop and Procreate brushes. 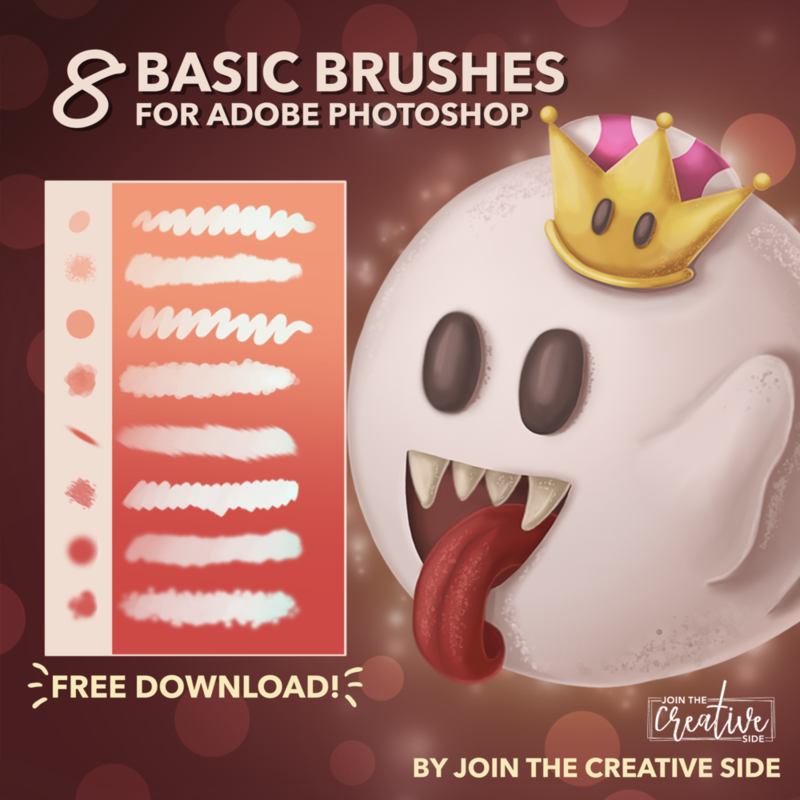 If you are in the digital art community: There are a lot of amazing artists out there who are looking for investing in digital painting brushes, so they can give their digital art an unique look. I use Gumroad for selling my Photoshop brushes, and I swear by it! It is easy to set up, customer friendly, and they have an amazing feature called ‘‘Pay whatever you want for it’’. Speaking of branding again: Why not create whole brandings in a branding kit. If you are good at designing brands, a branding kit is great to make. A branding kit includes a logo, font choice, color palette and graphic style. Again, those branding kits are not one of a kind, and they can be sold over again. If you have a lot of questions from your customers how you create those products; Why not turn it into a course and sell it in your Etsy shop. You can sell a document with a link to the content where you hosted your course. How wonderful! Why not start with publishing your course on Skillshare? Use this link to get 2 free months. If you are a fan of sewing, you can sell sewing patterns. These are a great way of passive income, and a lot of people like to DIY their products nowadays. The same for crocheting and knitting. If you create unique designs, you should totally sell your patterns. A lot of people that want to get organized need those sticky labels. They are perfect for organizing. And if you know how to create beautiful designs, this is a great idea for you. I mean, come on! People don’t like those boring white labels anymore. It is time for beautiful labels. You can sell them as a PDF, and people can download them straight away and print them. Stickers are great! You can use them for planning, decoration, or stick them to your friend's forehead. Kidding. If you know some great designs for stickers, why not deliver stickers as a digital download? Signs can be used for many purposes; Weddings, toddlers first day at school, restaurants, etc. And chalkboard signs are really trending now. You can deliver them as a PDF; your customers can print it, and frame it. Physical passive products are a great way to boost your income. I sell passive physical products like mugs, shirts and tote bags. They are passive because I outsource everything. Please pin this blog post on Pinterest with your followers. It is a small effort, but it is a massive impact for me. What is your favorite passive income idea? Let me know! Inside this bundle are my eight favorite brushes I use daily when I am digitally painting in Adobe Photoshop. (And they are the only ones I need!) From sketching to lining to coloring; This brush pack contains them all.